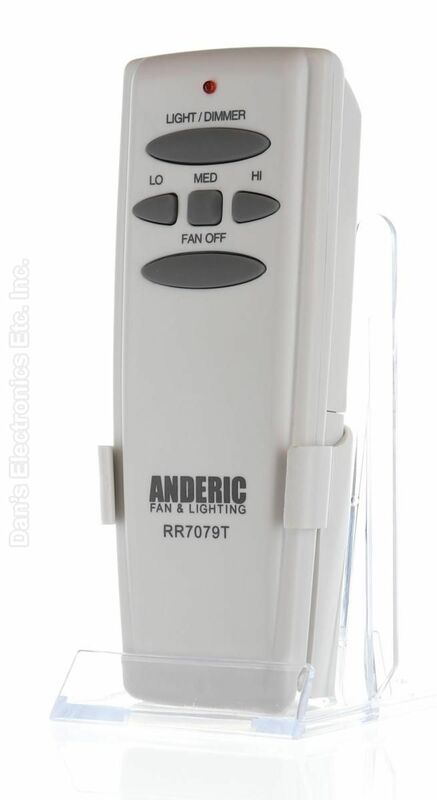 The original ANDERIC RR7079T FAN-HD Remote Control is in-stock and ships within 24 hours. 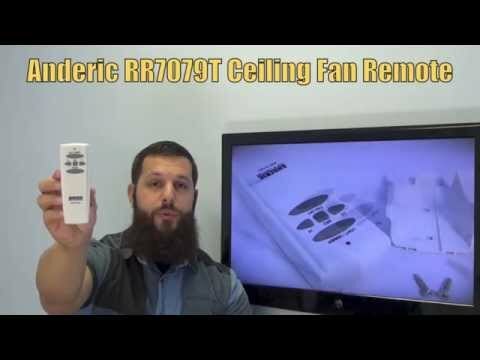 The original ANDERIC RR7079T FAN-HD Remote Control carries a 1-Year Warranty. 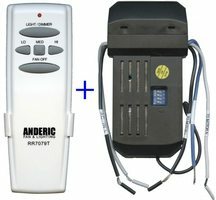 The Anderic RR7079T ceiling fan remote control replaces the Original Hampton Bay UC7078T or FAN HD remote controls. by Anonymous on December 10, 2013. Just what I had but better remotes, well worth the wait. by Anonymous on February 17, 2014. Exact replacement for my lost Hampton Bay remote. Just set the address and it worked right out of the box. by Anonymous on February 04, 2014. I do not usually write a review but I was very satisfied. Thank you. by Anonymous on January 14, 2014.
by Anonymous on December 18, 2013. This product is used for a ceiling fan. I would recommend the product to friends and family. by Anonymous on November 25, 2013.
by Anonymous on October 21, 2013.
by Deborah on March 09, 2019.
by donna on January 22, 2019. Works very well and easy to program! by John on January 10, 2019. Activated the remotes and all remotes work. Installed fresh batteries and programmed the dip switches to the respective remotes to match the fans non working remotes and all worked. Satisfied with the product and delivery. Website pictures and.description with original.part number very useful. by MITCHELL on December 07, 2018. Perfect replacement for 18-year old original. What a difference! Helpful, fast service from Dan's, too! by John on November 04, 2018. I had made the mistake of purchasing a ceiling fan without physical control and then accidentally threw away the remote. I was able to find this exact replacement which works perfectly. by John on October 06, 2018.
by KAREN on October 02, 2018.
by Carol on October 01, 2018. Great. It worked as advertised. by frank on September 26, 2018.
by James Harry on September 12, 2018. Needed a ceiling fan remote replacement. Customer service was great and sent one out right away. by Shurley on August 29, 2018.
by Frank on August 21, 2018.
by Michael on August 19, 2018. What I needed. I wish I had found this a few years ago. I wasn't sure which remote to order, I was quickly helped with Facebook DM. by Mindy on August 14, 2018. Lost the original remote and needed to find a replacement. Had a great experience Dan's electronics. Replacement arrived in a timely fashion and was programmed for the ceiling fan. It is working well. Thanks. by Catherine on August 14, 2018. Perfect replacement for my 17 year old Avion remote that finally gave up. Received it super fast too! by Lori on August 02, 2018.
by Ted on August 02, 2018. WAY TOO CONFUSING TO FIGURE OUT THE PIN SETTINGS INSIDE. I GAVE UP BUT GAVE IT ONE LAST DESPERATE TRY & MANAGED BY PURE LUCK TO PUSH THE CORRECT PIN. by EDWARD on July 31, 2018. Item arrived quickly, in perfect condition. Easy to get to work with fan receiver. Works perfectly. Easy, quick, and perfect. Can't do any better. by Brent on July 22, 2018. It works great. We were concerned because they no longer make the fan we bought and we didn't think we would be able to replace the remote. This remote saved us. by Lorie on July 18, 2018.
by Lisa on July 16, 2018. WORKS AS GOOD AS THE ORGINAL REMOTE. by Rene on July 13, 2018.
by mike on July 12, 2018. This remote worked perfectly. All I did was take it out of the box and put a battery in and it worked perfectly with my fan. by Abigail on July 05, 2018.
by Randy on July 05, 2018. Everything works except for the reverse, but they didn't use it any way. And easy to calibrate. by Kevin on July 01, 2018. My remote was so old and frustrating. This works better than I remember mine ever working. by Liz on June 11, 2018.
by Lawrence on June 08, 2018.
by AIDA on May 29, 2018.
by Tim on May 01, 2018. Quick delivery. Easy to use. by Curtis on February 15, 2018.
by george on February 10, 2018.
by Joseph on February 10, 2018. Thanks helped out ! Glad you got them! by Stephanie on January 19, 2018.
by Maria-Angeles on January 14, 2018. Works just like original equipment. by David on January 10, 2018. RIGHT REMOTE. EASY ORDERING. ON TIME DELIVERY. FAIR PRICE. NICE PEOPLE. WHY WOULD YOU LOOK ANYWHERE ELSE. by Michael on January 09, 2018. Just had to set the switches to match the old remote & it worked perfectly right out of the package! by Peggy on December 02, 2017. Fast Shipping Exact replacement part. by sheila on November 28, 2017.
by Robert on November 19, 2017.
removed from package, installed a battery and my new remote works beautifully! by brian on October 20, 2017. Works great, once you do switches correct. by David on October 16, 2017.
by Kathy on October 10, 2017. Absolutely great. The exact model with shipment cost was less expensive than the replacement remotes in the stores. Five Stars!!!!! by walter on October 07, 2017.
by Juan Carlos on September 21, 2017.
by Victor on August 29, 2017. Remote is as good as the original,thanks. by Michael on August 17, 2017. This remote works better than the original which was temperamental and unreliable.I'm very pleased with this one. by John on August 11, 2017. Works great. The original that came with the fan was always turning off and on at crazy times. These work perfectly and we haven't had any issues. by Dan on August 09, 2017. Works as well as the original one. by Gerald on August 03, 2017.
by Robert E on August 01, 2017.
by Randy on July 24, 2017.
by Ray on July 04, 2017. Works great, took about 5 tries to set the switches because of the different possiblities (lost our old one). Works just like the original one. by Charles on July 03, 2017. Great Remote. Worked without any issues! by Ajai on July 03, 2017. So glad I could replace a lost remote with the same type for my Hunter's Bay Fan. Reasonable solution instead of having to buy and replace the fan!!! by Carolyn H on June 25, 2017.
by Jeffrey on June 19, 2017.
by derek on June 18, 2017. Actually like this remoter better than the original. This seems more solidly built. by Jeff on June 06, 2017. Works perfect. Needed to replace the remote control for a Hunter Douglas fan. by Patrick on June 05, 2017. Will buy more, they work great ! by William H on June 02, 2017.
by Clarence on June 01, 2017.
by James on May 30, 2017. Arrived in perfect condition and as told. After putting in batteries it worked without any problems! Priced extremely well, and significantly less than a replacement from a local big box, did not require rewriting in fan. Very happy! by Susan on May 24, 2017.
by Linda on May 23, 2017.
by Kenneth on May 21, 2017. Works great! Seems like better quality than original remote. by Nicole on May 19, 2017. Perfect right out of the box. I'd suggest this site to everyone. by Matthew on May 19, 2017.
by John on May 15, 2017.
by SUSAN on May 14, 2017. Works awesome should have ordered long time ago! by Cheryl on May 13, 2017. Just what I wanted. It worked right out of the box. by Alvin on May 09, 2017.
by wayne on May 09, 2017.
by Michael on May 06, 2017.
by Anthony on May 05, 2017. Item is great. Shipment came fast. by Dianne on April 19, 2017. Excellent product. Worked just like the original. by Cecil on April 11, 2017.
by Joe on April 09, 2017. Worked perfectly as soon as I put in the battery and set the code inside the remote to match the fan code. by Phyllis on April 03, 2017. We had to figure out how to reset it. Other than that it works well. by dalesha on April 02, 2017.
by Mike on April 01, 2017.
by John on March 20, 2017. Great! Worked on initial setup. by Bert on March 10, 2017.
by Claire on March 09, 2017.
by william on March 09, 2017. It's working great so far! by Rosemary on February 26, 2017.
by elizabeth on February 23, 2017. Worked perfectly with my Hampton Bay Pilot 60 in. and 52 in. Brushed Nickel Ceiling Fan! Will definitely buy here again next time I lose my remote! by Andrew on February 21, 2017. Works much better than the original! by Richard on February 20, 2017.
by Meredith on February 14, 2017. Fast delivery, good product, work well. by Francois on February 14, 2017.
by Henry on February 13, 2017.
by ALMA on February 07, 2017. It works well and has everything my Hampton Bay remote had. I did have to program it. Fortunately, I had the old Hampton Bay one to determine the programming for it. by Joan on January 30, 2017. Item was exactly as described. Very sturdy. Arrived extremely quickly. Very well packaged against damage. Worked immediately! Excellent product and will do business with you again. by Karyn on January 30, 2017. Helpful service over the phone, easy pay and transaction, quick delivery, worked correctly with no problems. by William on January 26, 2017. Everything about this remote, ordering it , receiving it was excellent . by Sharon on January 13, 2017. Works perfect. Easy programming. Arrived on time. Will buy from here nxt time i need to replace remote. by karen on January 05, 2017. Worked perfectly. Internal DIP switch gives 16 unique codes. I just tried each one until the fan worked. Very satisfied. by Dennis on January 01, 2017. It works all I had to do is put in the frequency code. Dave. by David on December 08, 2016.
by George on December 03, 2016.
by Donald on November 08, 2016.
nice unit. arrived on time. by John on October 31, 2016.
by Gary on October 31, 2016.
by Karina on October 27, 2016.
by Amanda on October 21, 2016.
by Doug on October 04, 2016. The remote I purchased was just what I needed. The remote was easy to program and works just great! by Douglas on September 24, 2016.
by Henry on September 11, 2016. Thanks for the replacement The remote works easily, and is very convenient. Forgot to order the reversable feature. by Otelia on August 24, 2016.
by Patricia on August 14, 2016. Replaced old Hampton Bay remote--- works very well right out of the package. by Barry on August 12, 2016.
by Anthony on July 24, 2016. Works perfectly! As the original. Great buy. by Hugo on July 23, 2016.
by Elmer on July 14, 2016.
by Edward on July 14, 2016. Works great! I was very pleased to find a replacement remote on line because I couldn't find it in stores. Thank you for a product that works as it should and is reasonably priced. by Julie on July 12, 2016.
by Gerald on July 05, 2016.
by Nicholas on July 05, 2016.
by John on June 25, 2016. Put the battery in and it worked perfectly. Thank you. by Susan on June 21, 2016. One of the best products. It works very well. One of the best things is that you can have it shipped with the battery. That is really helpful. by Julia on June 14, 2016. Works perfectly and easy to set up. by Jennie on June 12, 2016.
by robert on June 09, 2016.
very easy to use barely have to touch it.I have had another for about a year have not even changed the batteries yet. by Bruce on June 05, 2016. This remote is better, by far, than the original remote that came with the fan. Solid construction and feel on the buttons. Wish I would have replaced it with yours years ago. by David on June 04, 2016. Great remote it works fine. by Michael on June 03, 2016.
by Jack on June 03, 2016.
by Michelle on June 01, 2016.
by Judy on May 31, 2016. Exactly like it was described. Works excellent!!' I would definitely recommend this site for remote controls. by Martin on May 30, 2016.
by Charles on May 27, 2016. Remote was delivered fast. I will order from here next time! by Amador on May 23, 2016. Great replacement remote, don't have push the buttons very hard now. by Mellie on May 22, 2016.
by Joshua on May 21, 2016.
by Peggy on May 16, 2016.
by Anonymous on May 06, 2016.
by Anonymous on April 13, 2016.
by Anonymous on April 09, 2016. Product was I feel superior to the original remote that came with the fan. Would have liked to have had a battery included with the remote. Overall very pleased with the replacement remote that I ordered. by Anonymous on April 06, 2016. Good quality remote with easy to understand directions. by Anonymous on March 28, 2016.
by Anonymous on March 22, 2016. Exactly what I was looking for to replace a remote control that just stopped working. by Anonymous on March 16, 2016.
by Anonymous on March 13, 2016. The product was excellent . . . just what I ordered . . . but the remote receiver needed to be replaced . . . and i thought the remote CONTROL needed to be replaced . . . SO. . . after I figured THAT out . . I sent the remote control back. The technician I spoke with was very professional. Needed replacement & have already used. 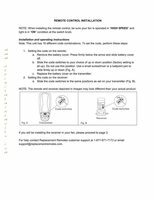 by Anonymous on February 22, 2016.
remote for ceiling fan, excellent service and would advise every one to use your service. by Anonymous on January 30, 2016. The replacement remote works every bit a well as the original did before it wore out. by Anonymous on January 28, 2016.
by Anonymous on January 23, 2016. 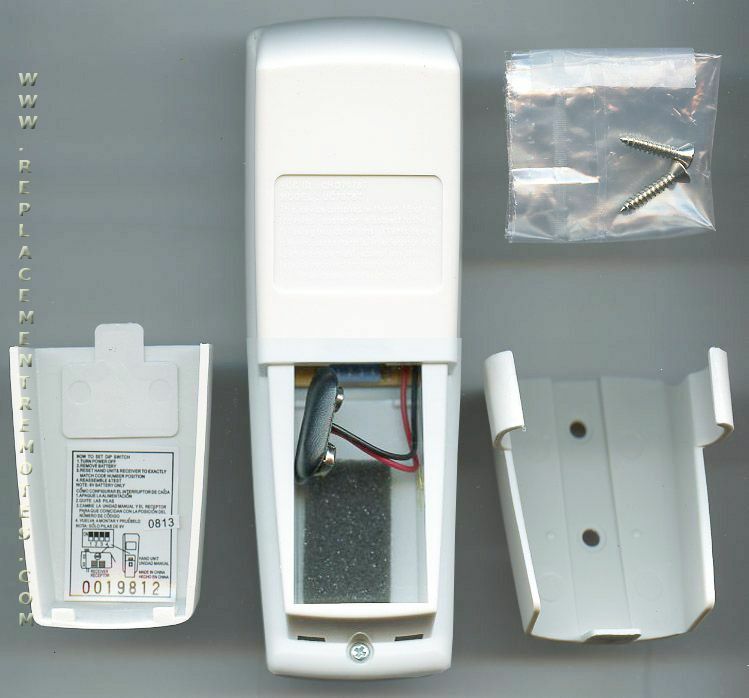 Product is replacement for no longer manufactured Hampton Bay remote. Works perfectly!! by Anonymous on January 06, 2016.
very good remote, it works as good if not better then the original remote. by Anonymous on December 18, 2015.
by Anonymous on December 14, 2015.
by Anonymous on November 10, 2015. The remote replacement worked perfectly. Exactly what I needed! by Anonymous on October 09, 2015. The correct remote on time. Easy to program. Thanks. by Anonymous on September 23, 2015.
by Anonymous on September 14, 2015.
by Anonymous on September 04, 2015.
by Anonymous on August 30, 2015. Good and fast service. Item was correct. Will use this company again when need to. by Anonymous on August 26, 2015.
by Anonymous on June 26, 2015.
by Anonymous on June 09, 2015.
by Anonymous on June 07, 2015.
by Anonymous on May 20, 2015. We use this remote daily and we like it. by Anonymous on May 15, 2015.
by Anonymous on April 30, 2015.
by Anonymous on April 28, 2015. This remote was purchased to replace a Hampton Bay remote that one of my tenants broke. Remote works as expected once the dip switches are programmed to the correct frequency. Uses a 9V battery instead of the A23/23A that most of my remotes use, and I was a little afraid of breaking the 9V connector when I removed the battery. In the end, I was able to disconnect the battery without incident, it just felt a little fragile. by Anonymous on April 16, 2015. Quality is the same that the original remote control. by Anonymous on April 15, 2015.
by Anonymous on April 07, 2015.
by Anonymous on March 27, 2015.
by Anonymous on February 25, 2015.
by Anonymous on February 23, 2015.
by Anonymous on February 15, 2015. Replaced my Hampton bay remotes, these worked perfectly. by Anonymous on February 14, 2015.
by Anonymous on February 04, 2015.
by Anonymous on January 26, 2015. The fan in question has no manual controls, so I really NEED a remote. by Anonymous on January 22, 2015. I have used the included wall mount and placed it high enough on the wall that the Baby can't get at it and make the new one disappear. by Anonymous on January 15, 2015.
by Anonymous on January 10, 2015.
by Anonymous on January 05, 2015. I set the dip switches and it worked. great job. by Anonymous on January 02, 2015.
by Anonymous on January 01, 2015. Good remote that I would recommend. by Anonymous on December 24, 2014. The replacements were quite a bit larger than the old remotes. But they look to be more robust and will perhaps work longer before requiring replacement. They also appear to have a farther range. by Anonymous on December 16, 2014. 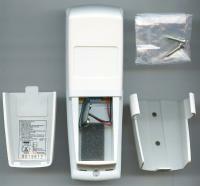 Product was a remote for a dining room overhead fan. No problems using it. Would recommend to anyone. by Anonymous on September 10, 2014.
by Anonymous on September 06, 2014. I would recommend this company to anyone who broke, lost or received a fan without the original remote. by Anonymous on September 04, 2014. Works as described. Perfect replacement. by Anonymous on August 29, 2014.
by Anonymous on August 22, 2014.
by Anonymous on August 21, 2014. Product works just as advertised! Put new battery in and ready to use! Did not have to program as was mentioned on the website. by Anonymous on August 12, 2014. For my fan at home. by Anonymous on August 11, 2014. I use the product for my ceiling fan and light to turn them off and on. I love it! by Anonymous on August 09, 2014.
by Anonymous on July 18, 2014.
by Anonymous on July 17, 2014.
by Anonymous on July 16, 2014. A perfect replacement model, just as great as the original remote! Works perfectly. by Anonymous on July 07, 2014. Remote for my ceiling fan. Works just as good as original. 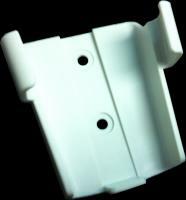 i use it in my sunroom, i would tell friends who have same problems with their fan remotes. remote is very simple to set. by Anonymous on July 06, 2014.
by Anonymous on June 27, 2014.
by Anonymous on May 29, 2014.
by Anonymous on May 27, 2014.
by Anonymous on May 23, 2014.
by Anonymous on May 19, 2014.
by Anonymous on May 14, 2014.
by Anonymous on May 09, 2014.
by Anonymous on April 16, 2014. The remote works perfectly. It is better than the original one that came with the fan. by Anonymous on April 15, 2014.
by Anonymous on April 10, 2014. Moved to a new condo and no remote was left for the ceiling fan. located the remote on your website and it worked! by Anonymous on March 17, 2014. Remote was for a Hampton Bay ceiling fan. The remote works perfectly and the quality is fantastic. No issues what so ever. I highly recommend it! by Anonymous on March 04, 2014.